"Once again, the Handbook of Industrial Robotics, in its Second Edition, explains the good ideas and knowledge that are needed for solutions." -Christopher B. Galvin, Chief Executive Officer, Motorola, Inc.
"The material covered in this Handbook reflects the new generation of robotics developments. It is a powerful educational resource for students, engineers, and managers, written by a leading team of robotics experts." - Yukio Hasegawa, Professor Emeritus, Waseda University, Japan. "The Second Edition of the Handbook of Industrial Robotics organizes and systematizes the current expertise of industrial robotics and its forthcoming capabilities. These efforts are critical to solve the underlying problems of industry. This continuation is a source of power. 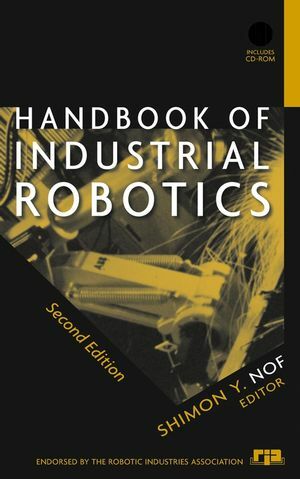 I believe this Handbook will stimulate those who are concerned with industrial robots, and motivate them to be great contributors to the progress of industrial robotics." -Hiroshi Okuda, President, Toyota Motor Corporation. 120 leading experts from twelve countries have participated in creating this Second Edition of the Handbook of Industrial Robotics. Of its 66 chapters, 33 are new, covering important new topics in the theory, design, control, and applications of robotics. Other key features include a larger glossary of robotics terminology with over 800 terms and a CD-ROM that vividly conveys the colorful motions and intelligence of robotics. With contributions from the most prominent names in robotics worldwide, the Handbook remains the essential resource on all aspects of this complex subject. SHIMON Y. NOF, a recognized expert in robotics research and applications, is Professor of Industrial Engineering at Purdue University's School of Industrial Engineering. Robots and Machine Intelligence (C. Rosen). Mobile Robots and Walking Machines (H. Schempf). Intelligent Control of Robot Mobility (R. Arkin). Group Behavior of Robots (G. Bekey & A. Agah). Management Policies of Computer-Integrated Manufacturing/Robotics (A. Gunasekaran). Robot Ergonomics: Optimizing Robot Work (S. Nof). A Strategy for Implementation of Robotics Projects (G. Soska). Fabrication and Processing (J. Black). Assembly: Mechanical Products (D. Whitney). Robotics Around the World (J. Ceroni, et al..